Well, I’ve finalized my 2010 Überlist! I’ve got a lot of crafty items on it. So for January, I’m finishing or frogging what’s on the needles! Because one of those WIPs uses Rhinebeck yarn, I also get to count it as a Rhinebeck month. I have so many WIP, this may stretch into February, but I hope not, because I really want to knit a Ganomey hat. I think it will be the perfect sleeping cap. 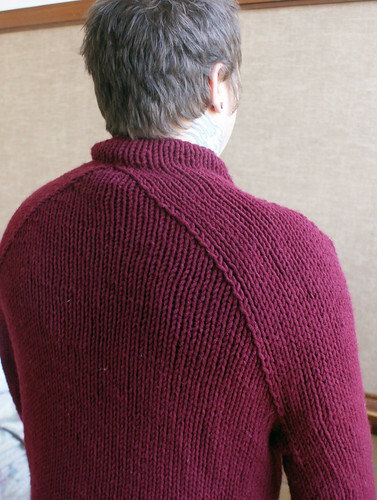 And I’ve already finished my first 2 WIPs for the year, Drusilla (on the down-low for now, but I can mention that it’s for Vampire Knits, out this fall from Potter Craft) and Ron’s Hurryup sweater, which I finished and blocked last night. Ta da! 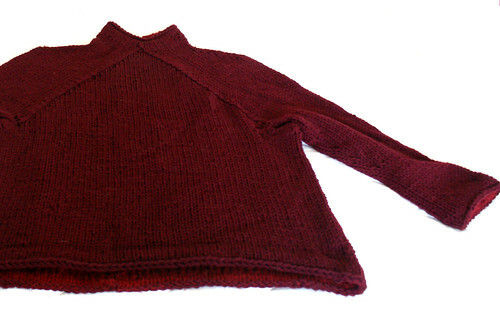 Pattern: Hurryup November Sweater from The Knitter’s Almanac by Elizabeth Zimmermann. You can also find it on google books. You can’t print it, but if you’re already knitting in front of your computer, it’s no bother. I actually own the book, but I can never find anything I own, so I used the online pattern. Yarn: Lion Brand Kool Wool (50/50 wool/acrylic), 11 – 12 balls + a bit of Knit Picks Decadance (100% alpaca) for hem interiors. It’s a nice lightweight, soft bulky, but the balls are a little small, so that was a LOT of non-spit-spliced ends to deal with. Honestly, the main reason I usually use 100% wool is so I can spit splice. But it was the right weight & color and kept me in my stash. Changes from the pattern: I can’t ever get the fit right on bottom-up sweaters, so I had to unravel and frog the last several inches of the hem. Initially, I cast on the sleeve stitches instead of knitting the sleeves bottom up, because I realized I’d have the same problem gauging the length. But you could see a line along the picked-up edge, so I went back and unravelled the cast on edges so I was working with the first row of the yoke, and worked the sleeves down as well. Ron has a broad chest for his size, so for the chest to be right, the arm math was off. I rapidly decreased in the pits to make a gusset of all the armpit stitches, then decreased on the 8th, 7th, 6th, and 5th rows, then knit straight to the hem. I cast off all edges, then picked up a hem lining out of Knit Picks Decadance, which is nice around the throat and provides a pretty contrastif you happen to see the hems. 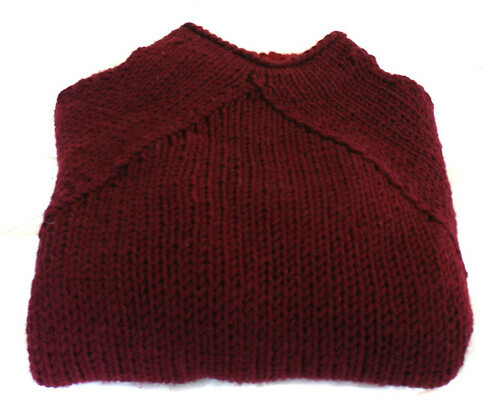 I knit 5-10 rows, depending on hem, and then loosely tacked down live stitches to the purl bumps. Will I make it again? Yes, definitely. 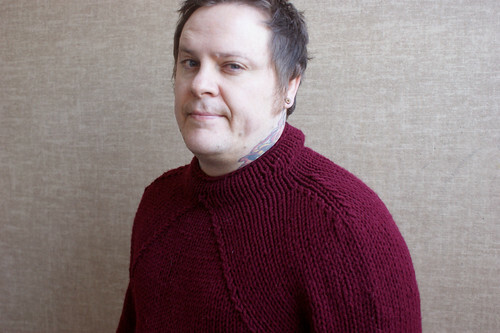 It’s a quick knit and a simple, striking look. What will I do differently? I’ll CO the total yoke and arm stitches with a provisional cast on, work from the shoulders up for the wishbone shaping, then work the body and arms down for an accurate length. What’s still on the needles? Look to the right! I’ve got my WIPs in my sidebar now! 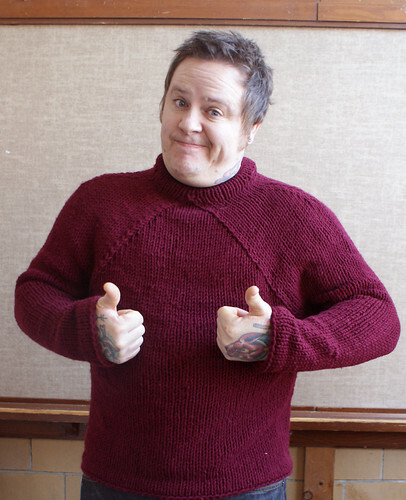 i’d love to know both where you get the pattern for that finished sweater, and also how you get the WIP thingie in your sidebar like that. i’d love to do that in my sidebar! Okay, so as part of my New Year’s Resolution I vowed to spend one week teaching myself how to knit. I can crochet like cuh-razy (and I do, just ask my yarn stash) but I haven’t picked up the knitting habit yet. But I want to. And your blog makes me want to. I can do it. I can totally do it. Right? The sweater is the Elizabeth Zimmerman Hurry Up November Sweater from the knitter’s almanac. You can find it on google books if you don’t have a copy. You won’t be able to print it out. I’m going to add some notes, now that you mention it! Love the architecture of Hurry Up. Must remember where I stashed my copy of Knitter’s Almanac. I’m intrigued by your idea for the next one. I love that sweater! It’s stylin’ yet manly.